Area : 1255 sq. km. Temperature : Max. 22° C. in Summer. Min. 1° C. in Winter. 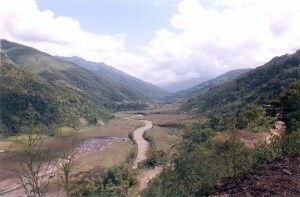 It is situated at a distance of 150 km from Kohima via Chazouba and 70 km from Mokokchung. It is the home of the Seemas. The town is spread out on the clusters of hillock. Seemas are considered to be the Martial Tribe among the Nagas. They have their colourful dances and songs. Their Ceremonial War dresses are worth seeing. Tuluni is one of their most important festivals. It is observed in the 2nd week of July every year. Satoi Range: One of the only remaining virgin forests left in Zunheboto district, is a place of pristine beauty. This place is a natural habitat of Blythii Tragopan, a rare bird on the verge of extinction. During the months of April, May you will also find rare rhododendrons adorning the hills. An ideal place for outdoor camping and trekking. Ghosu Bird Sanctuary: Situated 8 km from Zunheboto district headquarters, this bird sanctuary is solely maintained by the village community. This sanctuary is the habitat of more than 20 species of endangered birds. Migratory birds can also be sighted from the months of June to September. This entry was posted in Nagaland, Zunheboto and tagged about Zunheboto, Ghosu Bird Sanctuary, Satoi Range, Zunheboto map. Bookmark the permalink.